The Place After walking past VENUE by Sebastian in Downtown Gallery several times to get to Chen’s Mapo Tofu and Express by Chatterbox, I finally had the chance to try another highly raved restaurant in the hottest property in Tanjong Pagar at the moment. VENUE by Sebastian is helmed by Chef-Owner Sebastian Ng (formerly from the now-defunct Restaurant Ember), with a focus on modern European cuisine inspired by Asian flavours. The dining and kitchen space is extremely open concept, with curious passers-by peering into the 80-seat restaurant occasionally. The Food The menu at VENUE by Sebastian is very extensive, with more than twenty items on its menu with a take on sharing plates concept. You get the idea, come with a bigger group of friends and pig it out. There are overlaps in the lunch and dinner menu, with the former being a more concise version of the dinner menu. For something appetising to start, we recommend going straight for the Cauliflower fritti with spicy mint aioli (S$10), an addictive dish with crunchy texture and quite possibly our favourite way to enjoy cauliflower. The Grilled Spanish gem lettuce with burrata and mentaiko vinaigrette (S$19) shouts at me because of the mentaiko element, which is always a nice ingredient in Japanese sushi. Lettuce is typically plain on its own, but the addition of burrata and mentaiko vinaigrette changed the whole dish totally in a good way. 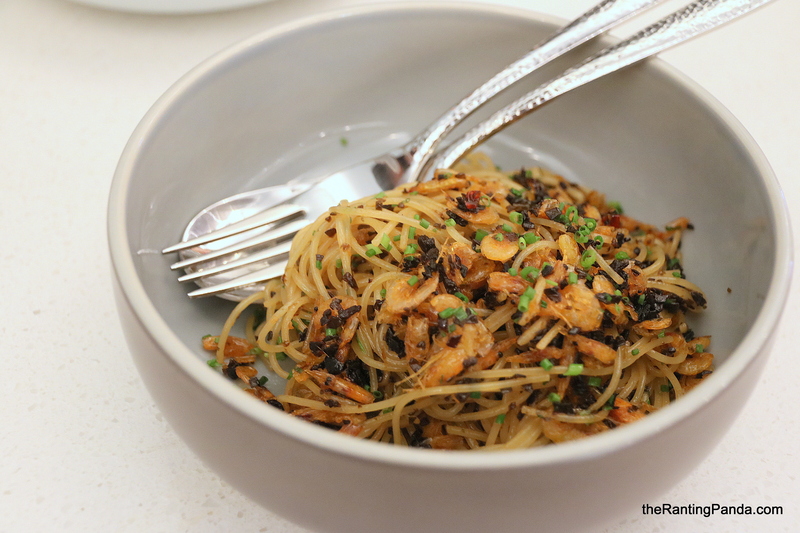 We enjoyed the varying flavours in this one dish. For soups, we enjoyed the simple flavours of the Jerusalem artichoke soup with crispy duck (S$8) beyond its simple presentation. The Pan seared foie gras, poached egg, maitake mushroom, cep sauce (S$24) is one of my favourite dishes. The cep sauce and mushroom components took away the usual greasy texture and flavour of the foie gras, which balanced the overall flavours of the dish very well. Another delight to have for me was the Grilled octopus, white bean purée, capers, burnt butter (S$27). Most grilled octopus tends to be too tough and overly chewy, but this version had the texture that was just right. From the seafood selections, one of our favourite dishes here is the Chilean Seabass with mushroom and bacon ragout and truffle yuzu butter sauce (S$36), one of the classic dishes of Chef back in Restaurant Ember days. We were too distracted by the delicious truffle yuzu butter sauce instead of the seabass. Even a simple dish like grilled chicken won’t go very wrong here. The Wood-grilled chermoula chicken with lemon (S$15), is marinated with house-made chermoula for two days before being slow-grilled to give it that tender texture and juicy flavours. Available only during dinner, we also enjoyed both the Cold pasta with konbu and truffle oil (S$22) and the Angel hair pasta with Sakura ebi and konbu (S$24). Both dishes are served in simple plating with no fanciful presentations, but it was no denial that both were equally hearty in its own way. We usually like our food hot, but the cold pasta is so simple, yet so delicious with subtle hints of truffle. The serving was too small and I could imagine having more of it. The Angel hair pasta with Sakura ebi and konbu follows the same simple fashion, with equally appetising flavours. Save some space for desserts if you are looking for something more than just ice-cream. The Pear tart, crumble with baileys ice cream (SS$14) is probably one of those dreamy combinations to conclude the meal. Rants The overly open concept may not bode well if you are someone who fancies privacy or if you are harbouring rendezvous plans. Will I Return Again? It is no doubt that VENUE by Sebastian is one of the more outstanding new restaurant to open this year. The food is good, setting is casual and we think that it is a great venue for a casual gathering over good food. This is one venue worth returning.